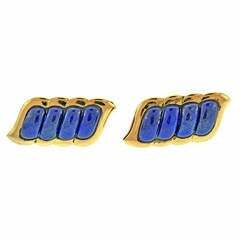 Stunning Pair of Boucheron Cufflinks from the Art Deco Period, with a great radiant geometric design. 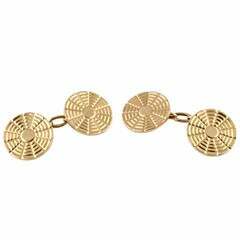 Boucheron, Pair of Cufflinks, Circa 1935 18k Gold (Marked) Signed Boucheron on both disc and numbered 29850 Wonderful patina of the gold. Excellent condition for the period. 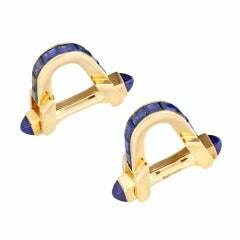 Handsome cabochon sapphire, rock crystal and 18K yellow gold bar cufflinks by Boucheron. Hallmarks: Boucheron maker's mark, OR 750, reference numbers, French 18K gold assay marks. 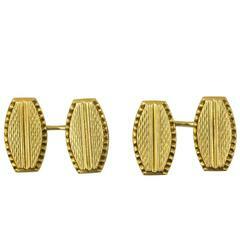 Classic 18K yellow gold cufflinks by Boucheron Paris. 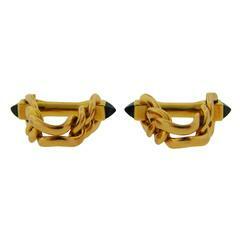 Hallmarks: Boucheron Paris, reference numbers, French 18K gold assay mark. 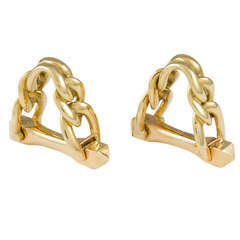 A pair of Boucheron heavy chain stirrup yellow gold cufflinks, signed Boucheron Paris and stamped 27338, circa 1920. Gross weight 16.64 grams.